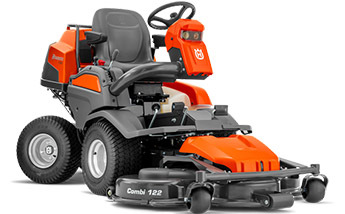 A compact and efficient All-Wheel-Drive front mower for year-round maintenance in complex and narrow areas. Includes 122cm deck and 852cc V-twin Kawasaki FX engine. The P 524 riding lawn mower is suitable for sports clubs and hotels as well as housing agencies and contractors who want a versatile, compact front mower that is highly manoeuvrable. Thanks to the front-mounted cutting deck the operator has a perfect overview of the working area. This means optimised trimming ability as well as accessibility under benches, bushes etc. Increased durability through long-life components. Attachments such as flail mower and broom give increased productivity all-year round. Price includes Combi deck 122cm. Combi deck 112cm also available via special order only.